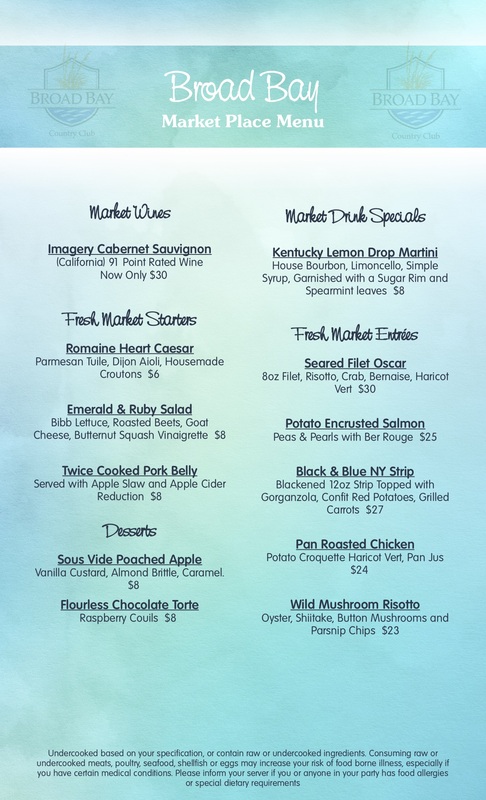 Visit Broad Bay for a new Dinner Menu every week! That’s right members, the New Market Place Menu at Broad Bay offers a fresh new menu featuring Salads, Appetizers, and Entrees every week. There is no need to go to the same boring restaurants with the same boring menu when you can come to your Club every week for a Brand New Fresh Market Menu! Each week, the latest Weekly Market Menu will be posted to our Website and in our Tuesday Web-Blast. Give us a call at (757)496-9090 Wednesday, through Friday to make reservations for a Fresh Market Meal at Broad Bay.